This movie has everything which you will expect from a brand Shafi movie – well a bit too much of everything. Had if the movie concentrated on delivering a feel in particular, rather than touching upon everything, it might have scored better grades. The movie started off by throwing light into the school days of Thomas, wherein he proves his mettle as an efficient mind gamer. 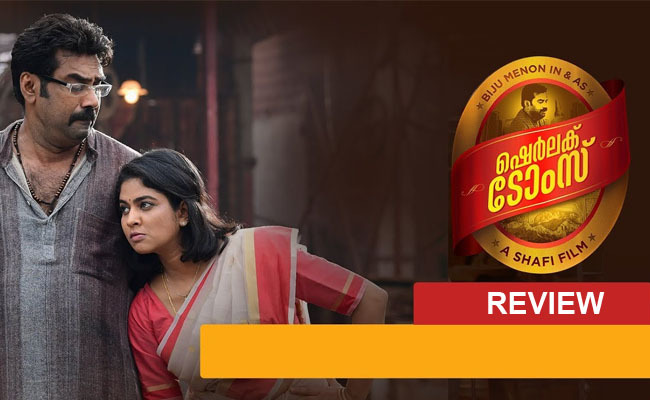 An ardent fan of Sherlock Holmes stories, Thomas went onto face some tough times in childhood, which however got solved later and today Thomas (Biju Menon) is an IRS officer, though he still keeps his fire as an investigating officer. Well, he got transferred into enforcement department, which proved to bring a whole lot of change to his life. On a parallel note, we can have a glimpse at a rather ruined personal life of Thomas with his devilry wife, Rekha (Srinda). The case with this brand Shafi film is that there are comic situations in abundance, though many were of over the top in nature. For instance, the characterization of Rekha appeared too arid to cope with and the combinations scenes between Thomas and Rekha turned out to be extremely painful at times. Even if the whole first have was devoted for drawing the characters on the board, there were instances when they crossed the border lines. It was evident that the movie badly wanted to earn the tagline of a crime thriller; ‘Sherlock Toms’ was actually somewhere in a position, wherein it struggled to meet the expectations from a crime thriller, while not shining brightly at comic parts as well. The script penned by Shafi along with Najim Koya, has nothing new in it, rather than featuring the life of an IRS officer – a position, which not many heroes in Malayalam cinema served. They had the luxury of making a decent thriller out from the plot, which they haven’t explored much. After a particular point of time, it was all a game of predictable moves, with makers diving too much with oft. repeated numbers. Along with it comes the whole unit of ‘Sherlock Toms’, which was strictly average by all means. The songs from Bijipal didn’t look energetic enough, while Alby’s camera works looked happy with limited output. Now comes the performances – the list led by Biju Menon. Thomas was a cakewalk for him. The character never dared to pose challenges to the actor in him. As usual, he delivered a decent outing. While Miya’s character had nothing much to do with her journalist act, the character of Rekha was something which demanded to be damned at times. Don’t know if the makers intended the same result or not. As Rekha, it would be been a better result if Srinda delivered a mellowed down act. All in all, ‘Sherlock Toms’ is a movie, which doesn’t boast any freshness in it, though it is still a onetime watchable. Tharangam Movie Review: There is no big waves…!